Economy Wooden Chalkboard, Many Sizes. This wooden framed chalkboard has a Green painted hardboard chalkboard surface. 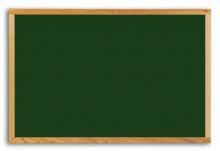 This economy-priced chalkboard, paired with a 5-Year Manufacturer Guarantee, is an exceptional value.